Jack and Jill are twins. When they were little they were divided by their parents. Jack was her mother's princess. She was dressed like a doll and wasn't allowed to make her clothes dirty. Jill was her father's tomboy. She was dressed like a boy and was supposed to be adventurous and athletic. The girls couldn't be the persons they truly wanted to be and lived like that for years. They are relieved when they can escape their stifling life, so when they find a door to another world they enter. Jack and Jill have choices to make. In their new world they can decide, but their decisions have consequences. Jack can be the scientist she's always longed to be and Jill can live a life in luxury with a closet filled with frilly dresses. However, this comes at a price. How much are they willing to pay for the escape from their parents and what will happen when their stay in the world they have entered comes to an end? 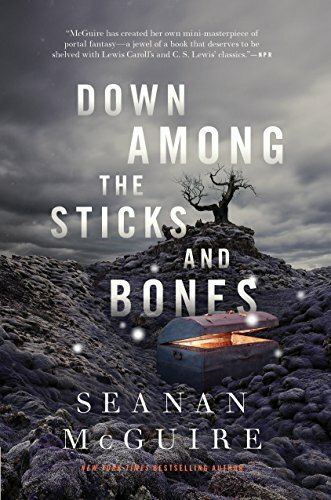 Down Among the Sticks and Bones is a fascinating creepy story. Jack and Jill are twins, but they couldn't be more different. Because of their parents' plans for them they aren't close. They resent what the other has and this leads to friction. When they can finally choose it's liberating they can leave their forced identities behind, but that doesn't mean they are safe and free. They haven't entered a friendly world and to become part of their new surroundings they have to make sacrifices. It was interesting to see what choices they were going to make and how this would affect their characters. Jack is friendly and hardworking. She has quite a few quirks and that makes her incredibly interesting. Jill's personality is darker and more volatile and that left me with a fabulous sense of dread. Seanan McGuire has written a beautiful series filled with magic and danger. She writes about darkness, longing to be somewhere else, unhappiness, identity crises and eeriness in a fantastic gripping way. I love her worldbuilding skills. The places she writes about are versatile, scary in their own way and intriguing. Finding out what would happen to Jack and Jill once they walk through their door kept me on the edge of my seat. Down Among the Sticks and Bones is a terrific scary story. If you love creepy YA you should definitely read the Wayward Children series. I'd advise you to read the books in their correct order. Wow, Fantasy, YA, Fiction and Horror! I need to read it! The cover has an ominous feel. I enjoy her October Daye series. I think I'll like this one too. Magic, danger, creepy twins! I love it, sounds great. It sounds so different from anything I have read but awesome too.I can't wait to read it! I'm liking the sound of this one! Thanks girls! This book sounds very interesting. This is a new to me author and I'll be looking for this. Intriguing characters, would be interesting to read the struggles and conflicts within their personalities and how they develope, in a creepy story.